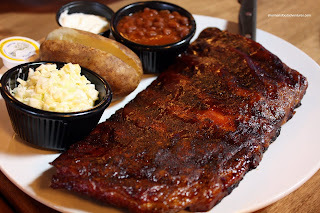 Good ol' Southern BBQ - baby back ribs, brisket, pulled pork with all the fixins'. Well, hold that thought because there ain't much of that in these neck of the woods. Sure, there's Memphis Blues (which is probably the best of the lot), Migz, Dix, Burgers Etc and if you want to stretch the genre, Montana's. 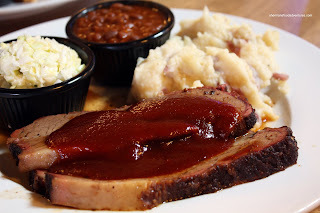 No, we're too far North for really good BBQ. But we do rule in the realm of Asian food. How about Korean BBQ, Chinese BBQ meats or even Tandoori? I know, I know, it's not the same thing. Thought I'd try... Well, other than the aforementioned establishments, there are others; but Ozark's has been on my radar for some time. One problem, it's in Langley. Well, it really isn't that big of an issue since I have been out to Abbotsford for pizza. Nikita and Bluebeard (fine residents of Langley) were up to trying this place out and I had planned to meet up with them. Kim joined us as well since Ozark's was on his "to try" list as well. Driving out to Langley was a breeze, no traffic really. 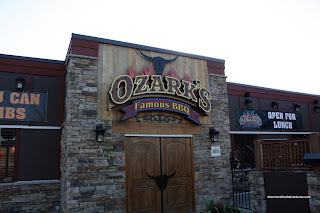 I'd passed by Ozark's quite a few times in the past and for some strange reason, I was doubting my own memory. Thinking I had passed the place, I decided to make a U-turn on Fraser Hwy. 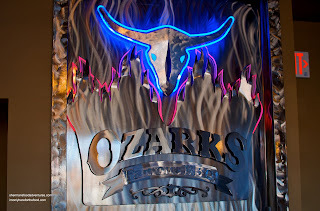 Turns out that I made the U-turn right in front of Ozark's! If I had only looked to my right... Finally arriving at the place, I was so excited to see their "all-you-can-eat" ribs sign that I walked right into a planter. How embarrassing, I got charley-horsed by a stationary object. Originally, I was worried that my son would have nothing to eat since it is a BBQ joint. The chances of him eating ribs are as good as me becoming vegetarian. 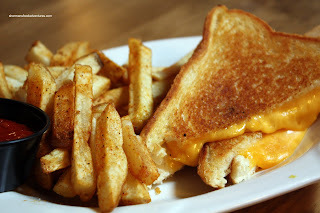 To our surprise, they had a kid's menu that included... grilled cheese... We have been saved! With his choice of food out of the way, Kim and I devised out strategy. Strategy? Yes, w e made sure that most of the meats were well represented at the table. Thus, after seeing that Nikta had selected the Side Ribs and Baby Backs for Bluebeard, Kim went for the Brisket Plate while I had the Beef Ribs. To make sure of things, Kim and I split a Pulled Pork Sandwich. Viv had ordered the same thing; but that would've been hard to share with us. Yes, Kim and I are dedicated to our craft. I actually refrained from the AYCE since I was meeting up with Costanza and Elaine for dinner later in the evening. Well, it turns out that the AYCE special was not necessary since the plate of 6 big beef bones was more than enough, especially for lunch. The consensus was that these ribs were pretty good. These were cooked until most of the fat had been rendered from the meat, resulting in a tender product. Flavour wise, there was only slight hints of sweet and saltiness. But there was no need for extra BBQ sauce. We liked that the meat was not overly charred, so that all of the it was edible. The 3 sides to my dish were all pretty decent as well. The coleslaw was pretty standard, quite similar to the one you'd find at KFC. Not really all that tart, it was crunchy and a bit creamy. The baked beans were soft while still retaining their shape. They were slightly sweet with strong onion flavour. The baked potato was alright, it was still slightly firm. 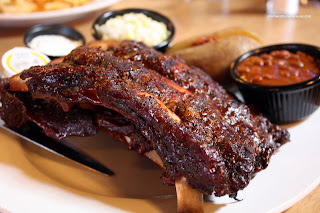 If that was the best dish of the meal, Nikita's side ribs must've been the worst. Dry, hard and lacking any real taste, these were not good. We realize that authentic Southern BBQ is based on cooking the meats from a raw state at a low heat over a long period of time. Thus, it will never be "juicy" per se. Well, call it personal preference, we weren't all that impressed by them. Fortunately, Bluebeard's baby backs were a bit more tender and moist. It was probably due to the baby backs having more meat and a bit more fat on them. With that being said, there was a lack of flavour and they weren't exactly moist. 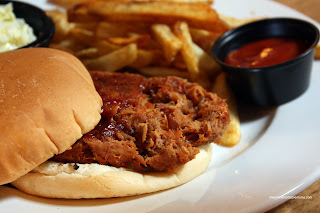 The pulled pork sandwich was another example of dry meat. It was a bit stringy and needed copious amounts of sauce. To be fair, it was probably their intention not to douse it with too much BBQ sauce since it's a lot easier to adjust it if had very little sauce on it as opposed to arriving drenched. On that note, the BBQ sauce itself was slightly smokey and predominantly sweet. The side of fries, to me at least, were good and bad. On one hand, they were nicely seasoned; yet on the other, they were not crispy at all. At least they were quite potatoey. Finally, Kim's brisket plate was alright. I liked that the brisket was not overly charred since it only takes away from the edible portions of meat. It was fairly tender and with a nice dousing of BBQ sauce, I didn't mind it. The side of mash potatoes was actually quite good with big hits of garlic. Now feeling quite bloated from all the meat, Kim and I decided to go for the Fried Cheesecake. Yes, we are indeed gluttons for punishment. 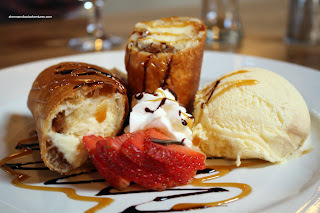 Similar to the one found at Dulcinea, the c heesecake is wrapped in a tortilla and then deep-fried. French vanilla ice cream is served on the side. Unexpectedly, the dessert worked quite well. The tortilla was crispy without being oily and the ice cream went well with it. We thought possibly there could've been more cream cheese flavour. This was a nice treat to end off the meal. It's too bad that most of the meats were quite dry and lacking in flavour. With that being said, the beef ribs were very good while the brisket and pulled pork were alright. They just needed more sauce. In my mind, Ozark's is passable. Nothing really all that special; although the side ribs were not very good. Probably okay if you live in the area (and if Memphis Blues is closed); but certainly not worth the drive if you're not. Finally! Another adventure in Langley! Recently started following your food adventures and love them! Thanks for your Ozark's review. I've been eyeing them for a while but have not been yet (all of my friends are in Vancouver and I don't like to dine alone). Next time you're out here, try Luxe Chinese Seafood Restaurant and Galini Greek Kouzina and Grill. Would like to get your take on them! Eat on! Thanks for reading misseeyu! Yah, there will be more Langley for sure. Thanks for the tips, will definitely try! Um, where the heck is this place? I walk or drive by 196 and Fraser hwy every few days and never noticed it...what is it beside? Definite must on the Galini's. Hi Tanya, it's right across the street from Willowbrook Mall and beside the Esso. Did you leave your GPS at home? It sounds like something I would do when I panic and think I'm lost. LOL about your run in with the stationary object. Now, that's what I call being distracted by food! I can relate as I have missed details, like the specials board, when I'm at a new place to eat. I think I'll stick to Memphis Blues when the rib craving hits me. 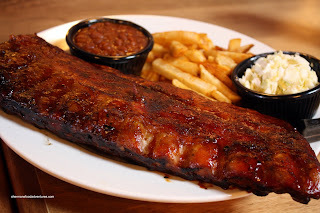 Otherwise, Seattle is a good place to look for tasty ribs, even if it is a bit further to drive than Abbotsford or Langley. It is actually at 196A and fraser Hwy - where Pepitas used to be for those who knew it!